The Nest Thermostat is the perfect gift for any home owner as it is a gift that just keeps on giving because it helps save you energy. I know you might think it’s a bit difficult to get too excited by a thermostat but the Nest Thermostat is different from the rest. Amazingly this thermostat learns from you. It gets to know what temperature you like when you are at home and will turn itself down when you are away. It will also learn how your home warms up or how draughty it is, so it will only use the energy it needs. This fabulous thermostat learnt about our habits after only one week and would turn itself up and down when needed. It learnt that I would put the heating on at about 6 o’clock in the morning and started warming up the house for me at this time. It also switches to Eco Temperature when the house is empty. I find this feature amazing as when you leave the house the Nest Thermostats uses its sensors and our phone’s location to know when we have left the house. When it knows we have left the house it sets itself to Eco Temperature to save energy. Another amazing feature about this Thermostat is that you can control it from your mobile phone, so when you are out you can turn on the heating on your way home so you arrive to a lovely cosy warm house. This feature is brilliant for the cold winter nights when you have gone out for the evening and want to come back to a warm home. The Nest Thermostat can also control your hot water. If your home has a water tank, you will find this feature brilliant. This thermostat comes with a hot water schedule which you can adapt from the nest app. You can boost the heat so you have extra hot water if needed and if you have gone away for a few days the Nest Thermostat will turn the hot water off for you. Nest also shows you how much energy you use every day in Energy History and, in the Home Report it shows you how much energy you use every month. This is very helpful in showing you when you use more energy and how to use less. The Nest Thermostat is very easy to use. To get you started a technician will come and install the thermostat in your home. You then just turn the temperature up when you need it and down when you don’t and then the thermostat will learn from your habits. The Nest app is also very easy to use and allows you to turn the thermostat on and increase and decrease the temperature when needed. Another feature that I love is the Farsight. This means when you approach it, it lights up to show the temperature, weather or time. You can even choose a digital or analogue clock face. This Farsight is very clear and bright and looks fabulous.it from across the room. The Nest Thermostat looks very stylish and is available in 4 colours so you can choose the perfect colour for any home. The colours available are: white, silver, black and copper. The Nest Thermostat can also be paired with other Nest devices. For example, your Nest protect sense smoke or carbon monoxide, the Nest Thermostat can display an alert. The thermostat can also shut off the heating system to keep the danger from spreading around the home. 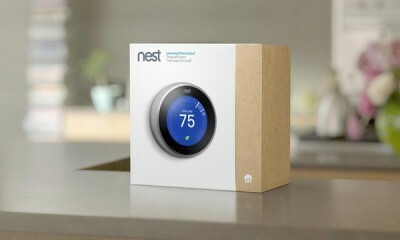 The Nest Thermostat is a perfect gift and anyone who uses this thermostat will wonder how they ever coped without one. It is available from www.nest.com and the RRP is £279 with professional installation and £219 without professional installation.